In this new edition that includes a study guide, popular author Walter Brueggemann writes that the Sabbath is not simply about keeping rules but rather about becoming a whole person and restoring a whole society. Brueggemann calls out our 24/7 society of consumption, a society in which we live to achieve, accomplish, perform, and possess. We want more, own more, use more, eat more, and drink more. Brueggemann shows readers how keeping the Sabbath allows us to break this restless cycle and focus on what is truly important: God, other people, all life. 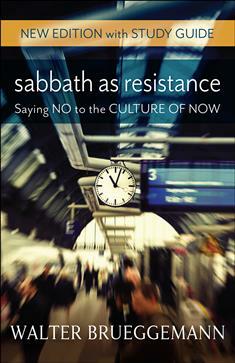 Perfect for groups or self-reflection, Sabbath as Resistance offers a transformative vision of the wholeness God intends, giving world-weary Christians a glimpse of a more fulfilling and simpler life through Sabbath observance.